The third elimination night was one of those surprising times. Just as everyone had settled down to hear Disco Music, the theme for the night was changed. “Country-Rock”……..what is Country-Rock? Wearing a cowboy hat, Ryan Seacrest said: The theme for tonight is the intricate fusion between country and rock. The guest judge for this night was Olivia Newton-John. 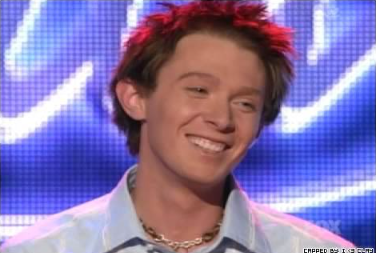 Singing Brian White’s hit, Someone Else’s Star, Clay Aiken was the highlight of the evening. Randy, Paula, and Olivia gave Clay a short standing ovation. Simon thought it was sweet, but just like his last performance. I hope you enjoy the video of this performance. Clay sang this song on March 25, 2003! Did you watch American Idol on TV last night? It was Hollywood Night! It started with 169 hopefuls – down to 24. Solo rounds begin on Easter Sunday (April 1), with the Top 24 revealed on Monday, April 2. I remember Clay singing this song and as always loved it. What’s not to love – it’s Clay and that magnificent voice! Thank you – really enjoyed the video. Error: Error validating access token: Session has expired on Tuesday, 21-Aug-18 16:13:01 PDT. The current time is Sunday, 21-Apr-19 22:12:16 PDT.